There are few periods in life more exhilarating than pregnancy. Even if you are a bit nervous about it, telling your partner that you’re going to have a child is a moment you are not likely to forget. There was a time in history when just saying the words, “I’m pregnant” was considered crude. Women would say things like “I’m expecting” or “I’m in a family way” when it was time to spread the news. When Lucille Ball, star of I Love Lucy, was carrying her second child, CBS considered the word pregnant too controversial to use. Today, of course, society is much less shy about pregnancy and all the associated ways of describing it. What matters when you’re having a baby is how to tell your partner that you have a little one on the way. If it is creativity you’re looking for, here are 20 ideas that might get the creative juices flowing. Next time you order coffee from his favorite coffee shop, ask the barista to write the word “Daddy” on his cup. Order a set of personalized labels for his beer bottles. Something like “Baby Johnston, due April 12, 2017” would work. Custom order, or create a coffee mug and write the words, “We’re having a baby!” at the bottom of his coffee cup. One morning surprise him with a hot cup of coffee and wait for the look of surprise you are sure to receive when he finishes that first cup of java. Arrange a photo session. 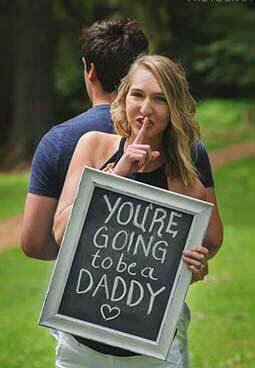 When he least expects it, allow him to see you holding a sign saying, “I’m having your baby.” Make sure the photographer is in on the ruse so she can snap a shot of the precise moment your partner learns he’s going to be a father. Write the words “big brother,” or “big sister” in chalk on the driveway and take a photo of your older child or children lying next to his or her new title. If you are seven weeks along when you give him the news, your baby is approximately the size of a blueberry. 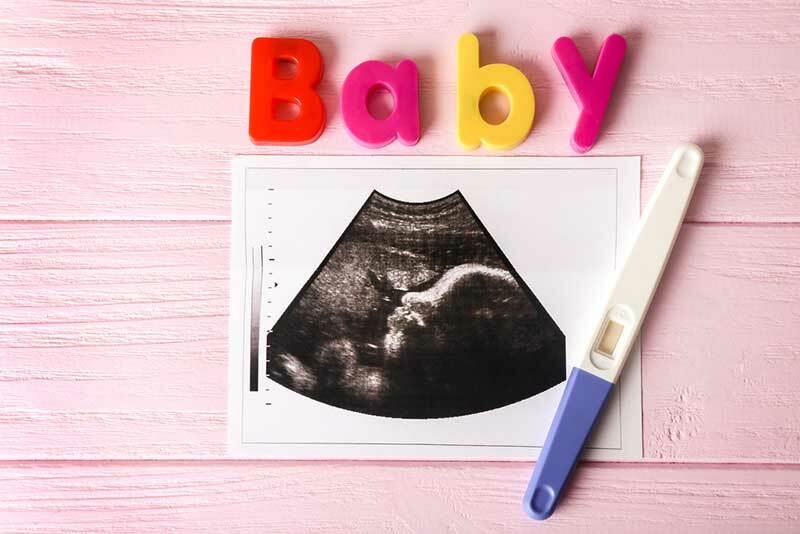 Place a blueberry inside a nicely wrapped box with a note that says, “Our baby is just about this size!” At eight weeks you could use a kidney bean and at nine weeks a grape. Find a nearby store with parking spaces dedicated to expectant moms. Have a friend take a photo of you standing next to the expectant moms sign. Or, on your next outing with your significant other, quietly park in the spot and silently wait to see their reaction when they read the parking sign and you acknowledge that the space applies to you. Write the words “You’re going to be a Dad soon!” on the inside of a pizza box so that he can see it as he reaches in for the first slice. Text a random ultrasound photo to him in the middle of his workday. You are unlikely to have one of your own this early, but there are plenty to be found online. Next time you’re out for dinner, slip a baby bottle to the server and ask him to bring your partner’s drink order in it. Place a pacifier in a ring box and lay it next to his dinner plate. Use lipstick to write the message on your belly and wait for him to find it. This one requires a little game board cheating: Ask him to play Scrabble and spell the news out using tiles. Write a note reading, “Mama’s having a baby!” on a piece of colored paper and attach it to your dog’s collar. The truth is, however you choose to tell your partner you’re pregnant, it is going to be a once-in-a-lifetime experience. Have fun with it.